Calpis (カルピス) is a Japanese uncarbonated soft drink, manufactured by Calpis Co., Ltd. , headquartered in Shibuya, Tokyo, and first marketed in 1919. The drink is sold as a concentrate which is mixed with water or sometimes milk just before consumption. 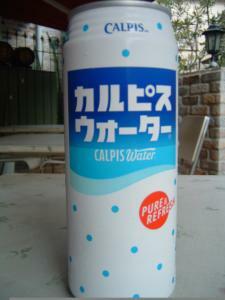 A pre-diluted version known as Calpis Water (カルピスウォーター) is also available. There is also a carbonated variety, known as Calpis Soda. The name Calpis was actually constructed by combining cal from calcium and pis from Sanskrit sarpis (good taste). The beverage has a light, somewhat milky, and slightly acidic flavor (it can be likened somewhat to vanilla yogurt). Its ingredients include water, nonfat dry milk, and lactic acid. There are many fruit flavoured variations. These variations include, but are not limited to, matcha, mango, pineapple (available in Okinawa only), orange, and with cream. Recently, Calpis is available in an apple flavored "morning blend" as well as a 70% calorie off version with calcium. Outside of Japan, Calpis can often be found in Chinatown supermarkets, under the trade name CalPico. © 2005 ChinatownConnection.com, Houston Chinatown Web Portal. Calpis. All Rights Reserved.